Along with the rest of the country, the 72nd Independence Day was also celebrated with patriotic fervour at Barpeta in Assam. 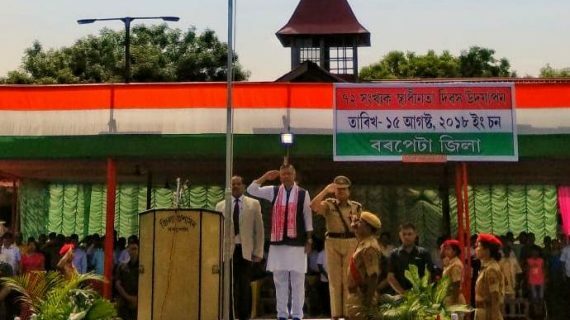 Assam Education Minister Siddhartha Bhattacharya hoisted the national flag of the centrally organized programme at Barpeta Government Higher Secondary School playground and took the ceremonial salute of the march past. Addressing the gathering, the State Education Minister presented a brief overview of the schemes implemented by the Centre and also the State Government. Bhattacharya also said that the State Government is taking all possible means to elevate the standard of education for the students of the State. The State Education Minister also announced establishment of nine women’s colleges across the State. He also thanked all those involved in the meticulous and herculean task of updating the National Register of Citizens (NRC) and lauded their efforts. However, the Education Minister evaded speaking anything regarding provincialization of schools as promised by his predecessor Dr Himanta Biswa Sarma. Commemorating with the occasion, model farmers, eminent teachers, noted litterateurs, fishermen and social workers of the district were felicitated at the Independence Day celebration programme.